Working as a Silicon Valley marketing communications manager in 1996, while starting to take on freelance design jobs, I decided to register my first web domain. Nelson.com was taken. 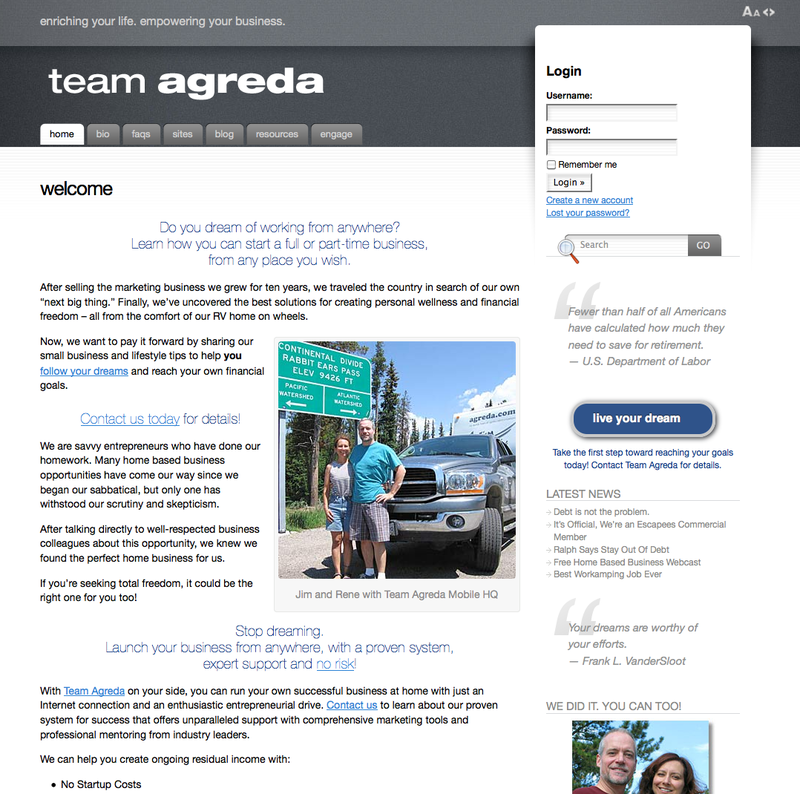 Rene and I had been making plans to get married, move North, and start our own consulting firm; so I registered this domain, agreda.com. It represents the root of Rene’s last name (Agredano), and literally translated it means to usurp, or overcome. This was perfect for the full service marketing solutions we intended to offer. Little did we know how meaningful that would become for us, or how this site would evolve in so many different ways over the years. 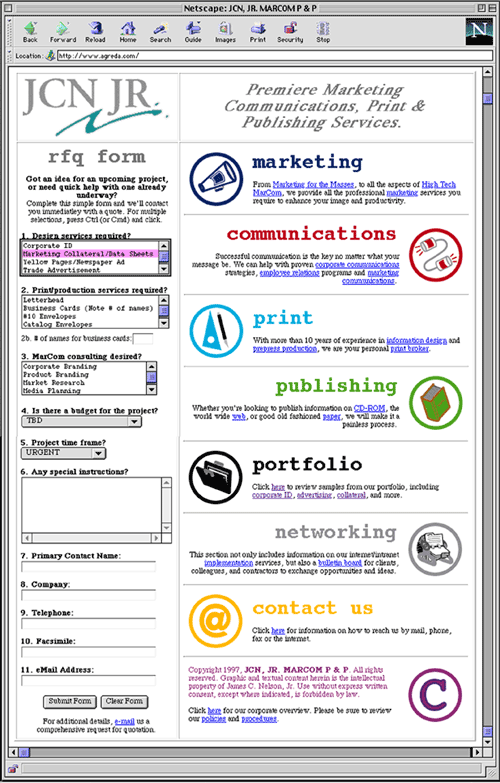 Yes, that’s the Netscape web browser with my first HTML website—complete with rollover effects, submission form and bulletin board access! Working out of the walk-in closet in our third story San Francisco walk-up, I was taking on small graphic design jobs while researching large format printers for the business we would soon start up in rural Eureka, California. It all started as JCN, Jr. Marketing Communications, Print & Publishing Services. 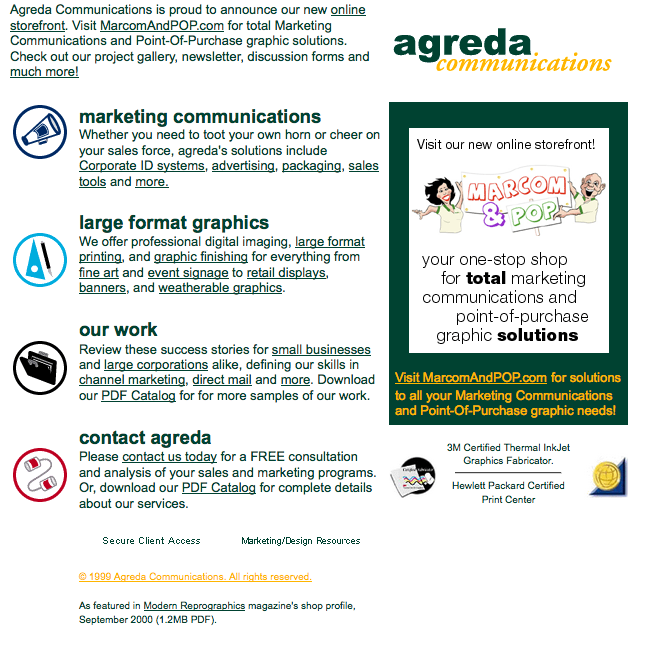 With Rene on board, plans to start our own graphics firm, and the agreda domain registered; that quickly evolved into Agreda Communications. Agreda itself would evolve incredibly over the years. 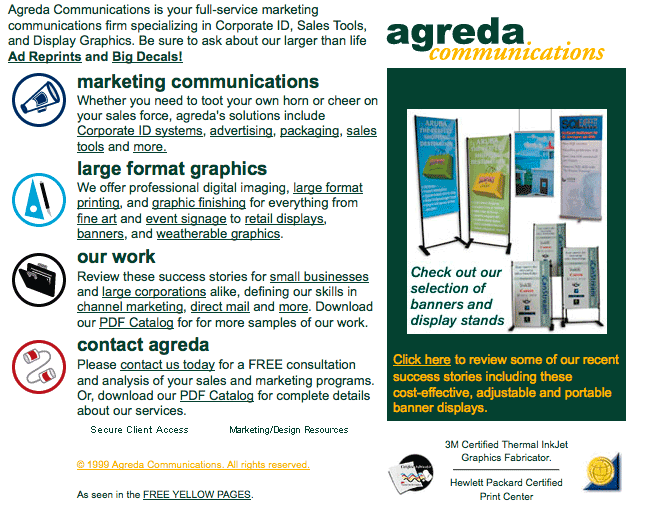 When we moved to rural Northern California, and purchased our first 36″ HP printer, we positioned Agreda as a full-service marketing communications firm offering in-house large format graphic solutions. The majority of our clients were still in Silicon Valley and all over the country, so we had to maintain a professional web presence. 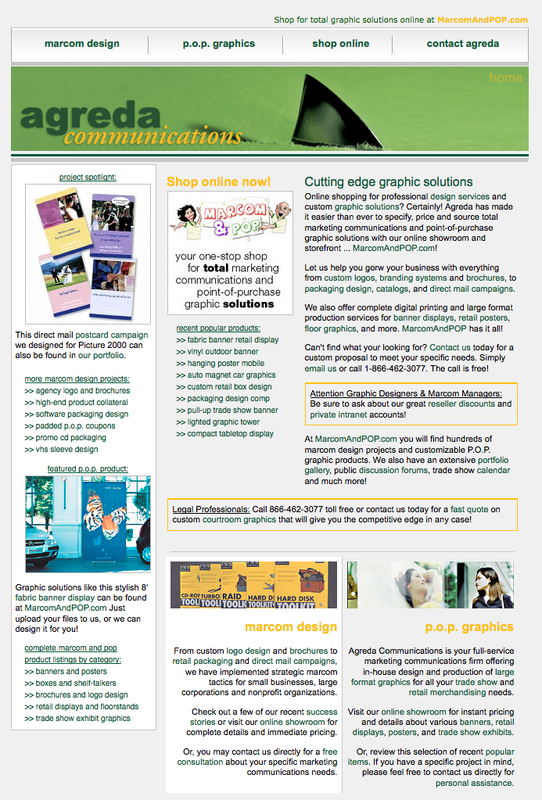 From 1999 through 2005, we continued to grow our design business while developing a new business model for our graphic solutions. My next big brainstorm stemmed from being sick of developing custom proposals and estimates for our design and graphic solutions. 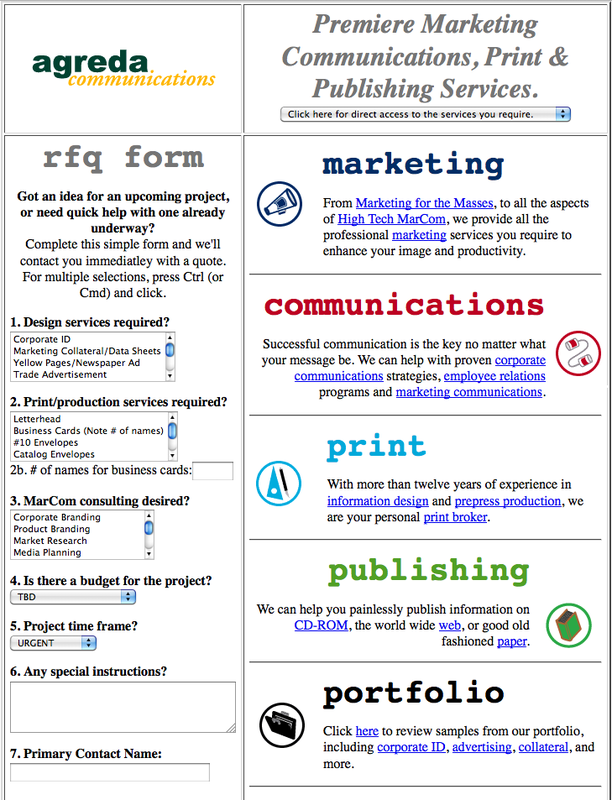 After a couple painstaking years in development, we launched the Marcom And Pop marketplace for Marketing Communications Design and Point of Purchase Graphic Solutions. 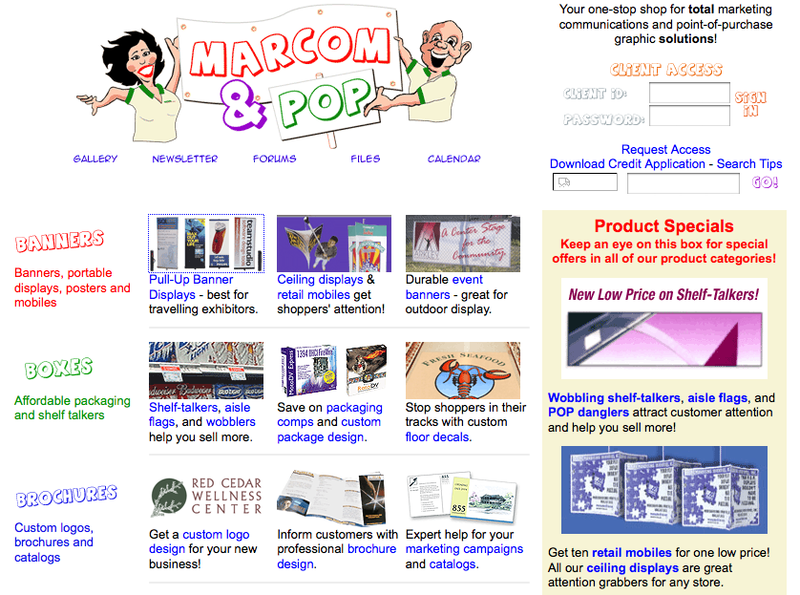 I was ahead of my time, there are now numerous websites that allow you to purchase design services and graphics with shopping cart checkout. 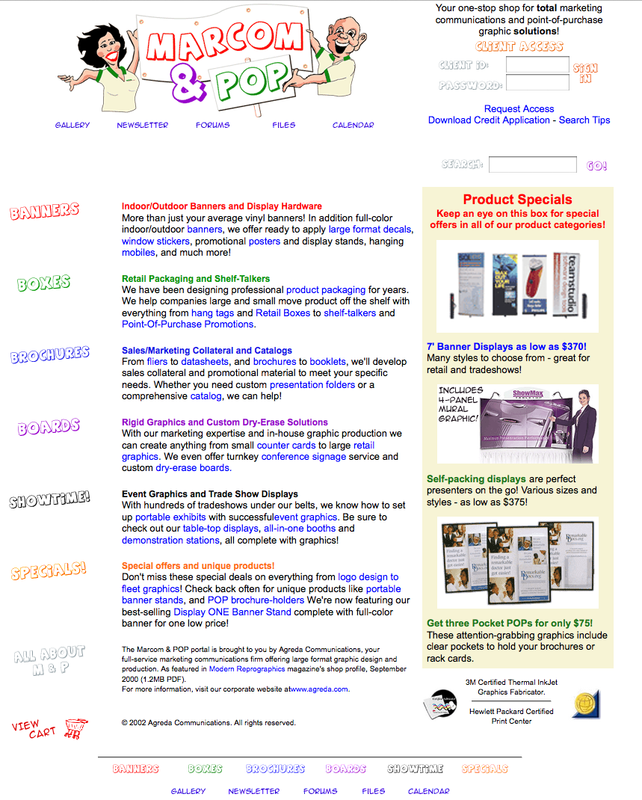 It was the sale of this website and business model that would eventually allow us to hit the road after our CFO (Chief Fun Officer) Jerry lost a leg to cancer. But I digress. 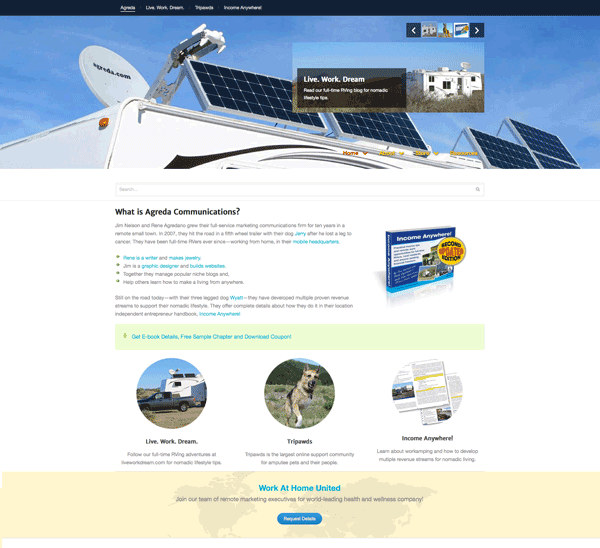 By the summer of 2007, we had already been using the WordPress site I installed at LiveWorkDream.com for about six months to market the sale of our business. Rene was the one who insisted we need a blog. Well, it did help us reach potential buyers and quickly sell the dream live/work experience we had created. But after discovering WordPress—and later, the power of multisite networks—my life has not been the same since. 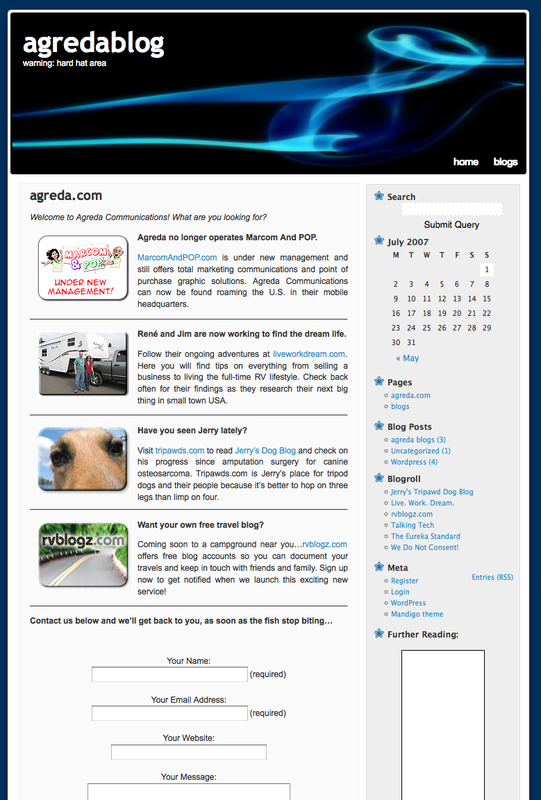 The first Agreda blog was basically a placeholder for whatever was to come of us. 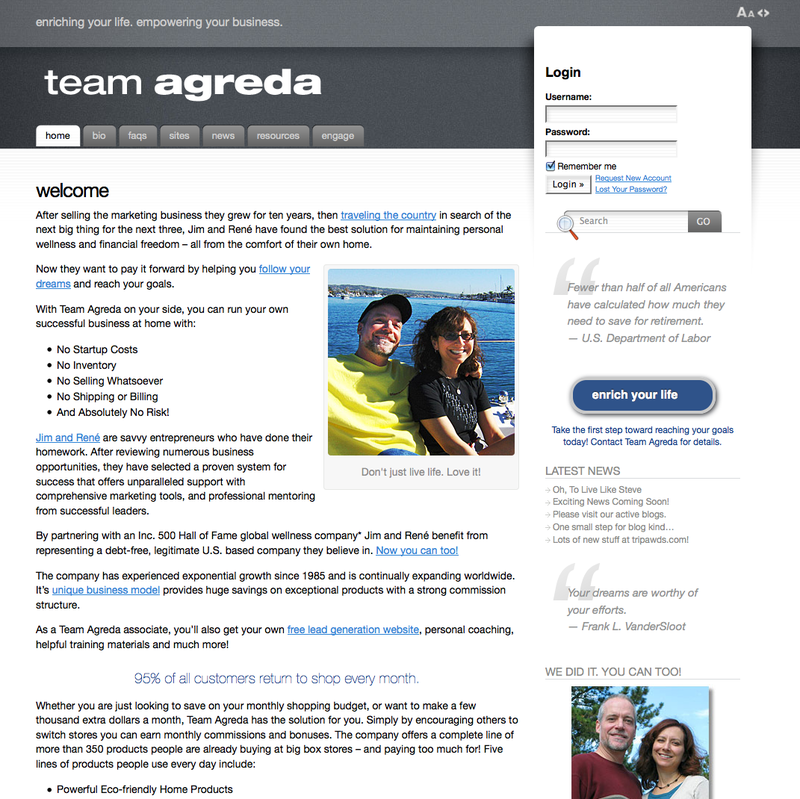 After we sold the business and hit the road, Agreda Communications as we knew it, was no more. It was and still is our company, but we were not operating it as a business of any sort really. Once our little sabbatical in search of the next big endeavor for Team Agreda turned into a full-time lifestyle, I redid the website to once again present a more professional appearance. We focused all our efforts, however, on growing the Tripawds network and our Live Work Dream blog. 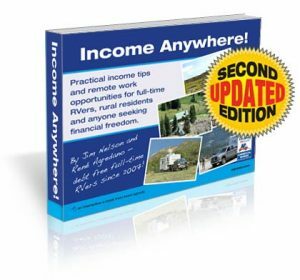 As we developed multiple revenue streams to support our nomadic lifestyle, we started using this site to sell our e-book, Income Anywhere! 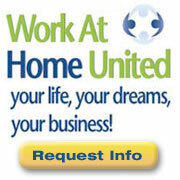 We had drafted much of the content to generate leads for our Work At Home United team of remote marketing executives. But WAHU was never our primary focus, and Rene always hated those “real estate” photos, as she likes to call them. So that inspired the latest makeover. Got feedback? Leave a comment! And just for reading this far, use coupon code RELAUNCH16 for 70% off Income Anywhere! 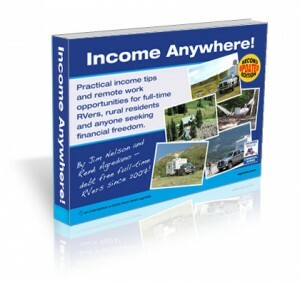 That’s just $2.99 for e-book filled with remote income tips. Limited to first three takers. If code does not work, all coupons have been used.